It appears the rich have gotten richer following Saturday’s highly anticipated UFC 116 event. After witnessing Brock Lesnar post a come-from-behind submission victory over Shane Carwin, president Dana White claimed the heavyweight unification title bout capped-off an unforgettable evening for him. 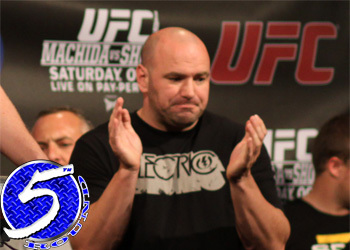 “This is the best night of my career, ever,” White emphatically told MMAFighting.com. “I don’t know if I have ever felt this way about fights. It was a great night. Every fight was dynamite. These guys came out and gave 110 percent. I always feel like a goof when I say this about grown men, but I’m proud of all these guys tonight. They delivered. Out of the 11-bout lineup, four fights went to the judges’ scorecards. However, half of those were split decisions and one unanimous rendering was George Sotiropoulos’ highly entertaining lightweight tussle with Kurt Pellegrino. Every other bout ended with a spectacular finish. It was a great way to end a rocky three-month stretch, which featured UFC 111 and UFC 112 – admittedly, two of the biggest duds in company history. Despite the solid effort by the entire cast of characters, no personality shined brighter than Lesnar. Although he started his celebratory speech humbly thanking everyone but himself, the controversial wrestler managed to find a way and bring things back to Numero Uno.